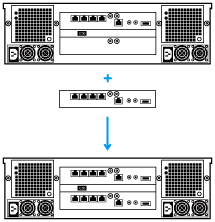 With active-active controllers and LACP/ Trunking, the AccuRAID AR316ITR and AR424ITR (dual controllers) are capable of delivering up to 1250MB/s* and 220K IOPS*, while AR316IT and AR424IT (single controller) are capable of reaching 650MB/s* or 120 IOPS*. * Performance varies based on system hardware. 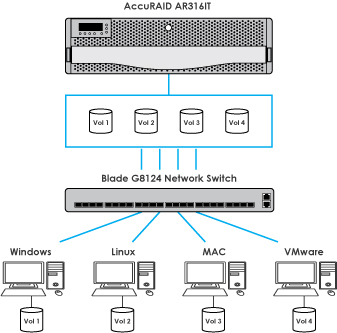 AccuRAID's innovative design allows customers to start with a single controller, offering dual 10G iSCSI ports, and upgrade to active-active redundant controllers at a later time. AR316ITR and AR424ITR with dual controllers provide high-availability and robust storage capabilities in enterprise IT environment. Both the AR316IT(R) and AR424IT(R) offer a peace of mind due to their high quality constructions and redundancy features. In addition to hot-swappable redundant controllers, the AccuRAID iSCSI units are also designed with redundant power supplies and cooling fans, providing protection against hardware component failures. With modularized design for easy replacement and service, the AccuRAID iSCSI units provide highly reliable storage for the most demanding IT storage application. Storage expansion via built-in SAS expander supports up to a total of 96 hard drives (288TB in raw capacity) with up to 3 additional JBOD units, providing the best return on investment. With built-in multi-RAID volume support, online expansion and RAID migration, IT administrators could now increase storage capacity without service interruptions or system down time. 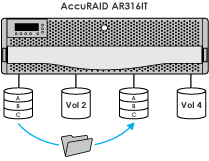 Feature-rich AccuRAID iSCSI units are designed with a snapshot feature without the need for additional software. Snapshot provides a point-in-time copy of the data and allows IT administrators to roll back the snapshot copy to recover previous data. 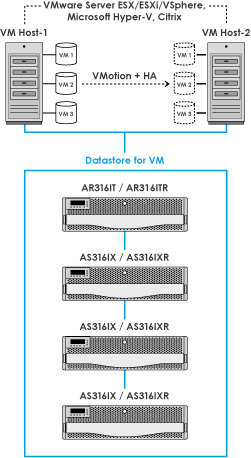 Up to 16 volumes (32 snapshots are supported per volume), total 512 snapshot volumes per system, are supported. The high-performance hardware RAID processor is built-in into the AR316IT(R) / AR424IT(R), freeing CPU utilization to other task, avoiding performance impact on the host server when such feature is in action. Based on Snapshot technology, the VD Clone feature allows two virtual disks to create the exact same copy of data, resulting in an additional copy of volume data for security purposes. iSCSI uses SCSI protocol over Ethernet to provide high-speed block level data transfer. By utilizing Ethernet, iSCSI is not limited by physical location limitations, where the storage unit must be in close proximity to the server or hosting computers utilizing the iSCSI storage service. The AccuRAID iSCSI units provide excellent data transfer throughput via Ethernet and are excellent choices as storage building blocks for high performance SAN (Storage Area Network) due to their high availability, high performance and expansion capabilities. 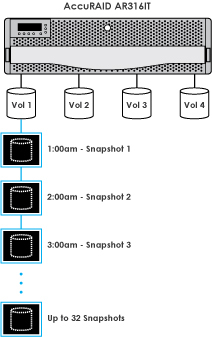 Clustering consists of two servers using the same volume. 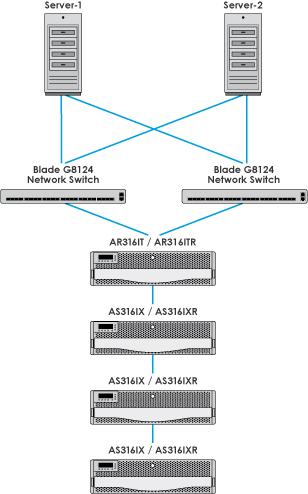 With dual controllers, dual network cards and dual network switches, the AR316IT(R) / AR424IT(R) eliminates single point of failure, acting as a mission critical solution meeting clustering computing requirements.